Pour mango nectar, lime concentrate and water into a small saucepan and sprinkle with gelatin. Allow gelatin to soak for a few minutes. Heat on low, stirring constantly, until gelatin is fully dissolved (about 5 minutes). Remove from heat. Stir in the vodka and Cointreau™, making sure to fully incorporate. Pour into pan, and refrigerate until fully set, several hours or overnight. To serve, cut into squares. Cut small pieces of the mango segments for garnish, if desired. 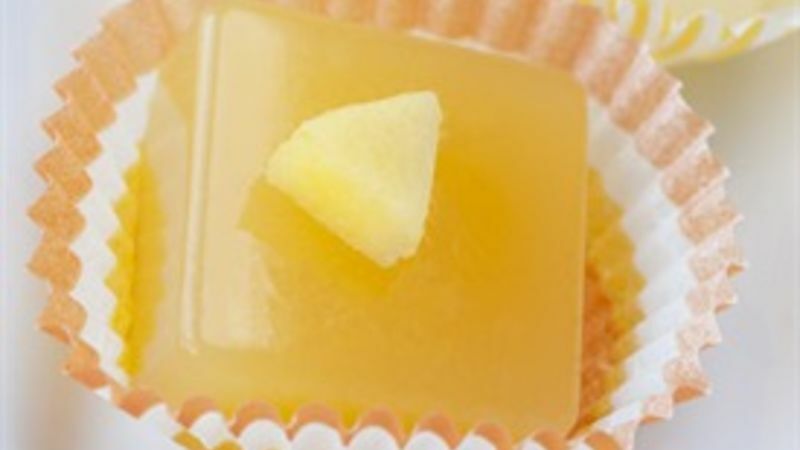 These Mango Cosmopolitan Jelly Shots were created in response to a reader inquiry (we’ll call this reader Mr. X, not to be mysterious, but because I don’t know his name). Mr. X’s wife loved mandarin vodka, and he wanted to surprise her with a mandarin vodka based jelly shot for her birthday, at the party he was planning in her honor. (How adorable is that – can’t you just see Mr. X. in his little apron, whipping up a batch of jelly shots?) Apart from the classic Cosmopolitan Jelly Shot, I didn’t actually have any recipes with mandarin vodka. And, as delicious as a Cosmo is, it doesn't quite showcase the sweet orange-y goodness that is mandarin vodka. While it wouldn’t fit the bill for Mr. X., the traditional Cosmo was a good starting off point. A few minor tweaks later – i.e. a swap of white cranberry for regular and the addition of a little mango nectar – sweet, subtle and ever so slightly tropical Mango Cosmopolitan Jelly Shot was born! I hope it fits the bill for all you mandarin vodka lovers out there (including you, Mr. and Mrs. X)!